Here’s what’s happening: your cooking skills leave a lot to be desired, you’re knackered after a long shift and your date has just text you to say they’re on their way round. You’ve already botched the starter, slaughtered the main course and are just beginning to lose all hope of getting anywhere tonight. Then you suddenly remember about this awesome recipe you read earlier, and how a 25 minute baked pear dessert will save your night. Never baked a thing before? No problem. They couldn’t be easier to make, take only five minutes of prep, and always turn out great. Out of cologne? Don’t fret. Stand next to the oven and waft the delicious cinnamon about the place. You and your flat will smell great. And the best thing? The baked pears look fancy by default – as if you were dishing up some sort of Michelin Star/Gordon Ramsay type of thing. You’ll see. And here’s an interesting fact about pears to further impress your date. (Being a proactive kind of guy I’ve mapped out the conversation for you. You’re welcome). You: Did you know that pears help to lower the risk of type 2 diabetes? You know, the serious high blood sugar disease that affects millions and millions around the globe? You: I know, I thought the same!! How can a fruit high in sugar be good against diabetes, right?! Well, it’s because pears contain flavonoids. And that stuff really helps to improve insulin sensitivity (1). She/He: You’re so clever! I love your interesting and knowledgeable facts (smiles). By this point you should be in and can safely proceed with further actions. Cinnamon Baked Pears. They are super simple to make, take only five minutes of preparation, 25 minutes of baking, and always turn out great. Preheat your oven to 175°C (350°F). 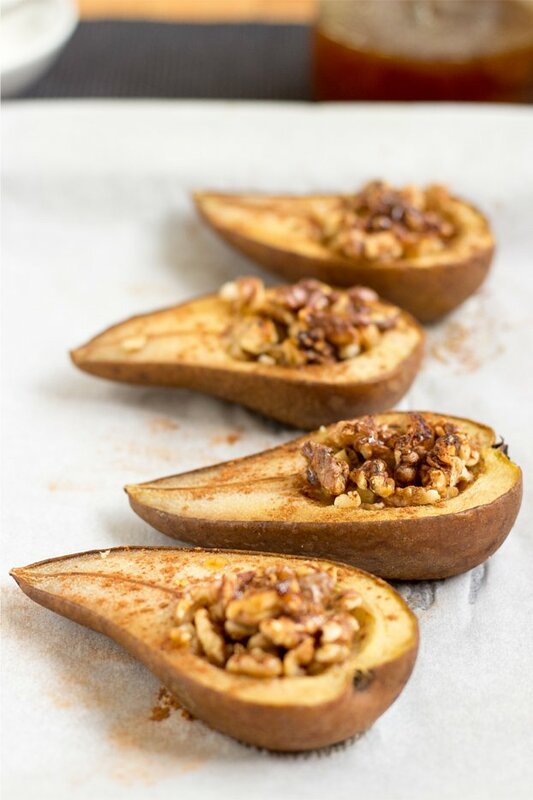 Fill with walnuts and drizzle about half a tsp of maple syrup over each half. Loved baked stone fruits.. these pears are so simple yet delicious! I love baked fruit…I “bake” my pears and apples in the microwave. I use a coffee mug, and cover it. For the apples I core them. I stuff honey, cinnamon and a smidge of butter down inside, cook for 2 mins. Sometimes I peel the red pears (green and brown pears work best) I never peel the apples. Mostly because Im lazy lol.. If you didnt want to use wine or butter you could definitely sub any juice, or maybe almond/coconut milk. I have several variations of these, oats added to the apple stuffing is so good. Oh wow, that’s a cool idea to prepare them! I want to use wine and butter, that sounds absolutely delish!!! Hey what a beautiful picture you shot. You nailed it, both for the click and the recipe! Hey Howie! 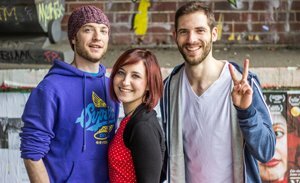 You motivated me to blog travel today and so glad I did. 😉 I don’t make a lot of desserts because of my sugar problem but these ingredients are perfect. I’m going to try these this week. Thank you! Glad to hear! To be honest I also don’t make a lot of desserts. But this one just fitted too well in our blog concept! It’s strange, I don’t like cinnamon but you’ve made these look so yummy I really want to make them!! thanks for the props! Really?? how can you not like cinnamon?! I put it on anything (almost). Haha – I love your solution to being out of cologne!!! This would be one intoxicating smell – and such an elegant looking dessert! Will regular yogurt you buy from the grocery store work (i.e Yoplait)? But I will try it as soon as I find out what kind of yogurt I can use. Thanks guys! Well, actually that might not have come out 100% clear in the description. It’s just plain natural yogurt that we used as a topping after we baked the pears. I’ve always have trouble with cooking pears. they are always hard when you buy them, and I don’t know how long before they ripen up. 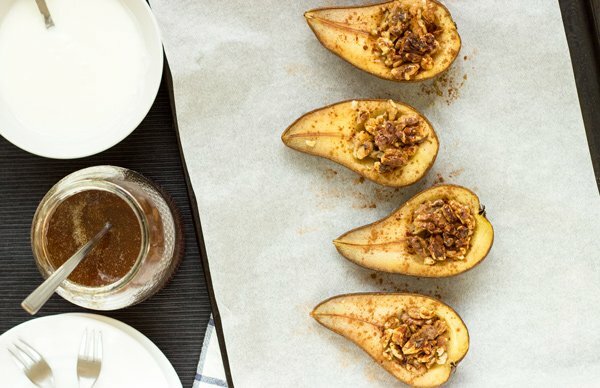 So do hard pears right from the store work on this recipe ? Do the nutrition facts provided include the walnuts, honey and yogurt? Sorry for not being clear on that! I hope they turn out well! How lovely for you to respond so quickly, thank you. The pears came out delicious. I’m going to follow you on Instagram now. My focus is Vegetarian dining with a successful commitment to Weight Watchers too. Awesome to hear that the baked pears came out great!! yum…i have pears from harry and david that i recieved as a gift….was wondering what to do with them…cant wait to try this today..ty so much for posting. Plus the photos are super cool, thanks for sharing, Julie!! 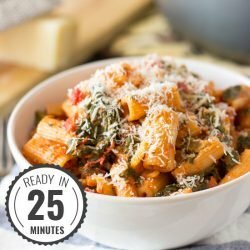 I have been trying healthy recipes for my family. This is very easy and tasty. I baked pears today. I just used raw hibey and sigon cinnamon. I was delicious. With he right inspiration I think it’s not too tough to eat healthy. These are light and delicious! 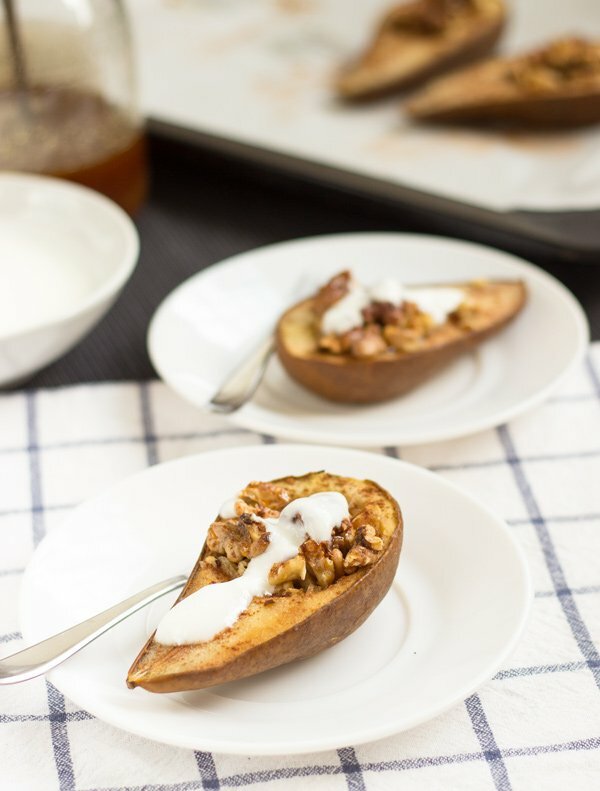 I love baked apples and these are a step up in elegance! I am taking a big pan to a dinner party tonight. Serving them with vanilla or vanilla caramel ice cream for a little decadence! 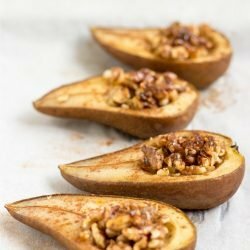 Was wondering if you might have a replacement in mind for the walnuts? If not, would the cooking time change much without them? Food allergies are no fun. Yeah, allergies can be very annoying I bet! So easy to make and delicious! My husband and my 2 year old gobbled these up. 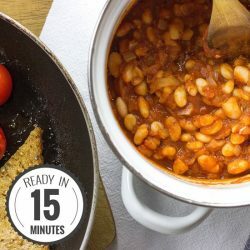 It really did take 5 minutes to prep like you said! I’ll be keeping this recipe. And as an added bonus, it was a healthy dessert. 5 stars for sure! Thank you! Oh… These look absolutely fantastic! I have a couple of pears, two different kinds, but both quite juicy and sweet and this will be perfect. I’ll have them tonight for dessert! What is considered a serving? One half or two halves? All of your recipes are so great; I really can’t pick out just one. 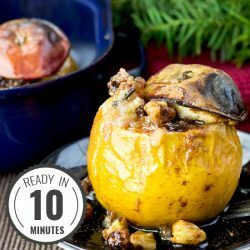 And this baked pear recipe is going to be great this fall. Thank you! looks delicious. What’s the parchment paper for? I just wanted to make sure the pears wouldn’t stick.